The cathedral has always meant more than mere Gothic splendour throughout France. When the spire broke and fell over, we felt as if it was plunging straight into our hearts. To all of us in Paris, and throughout France, Christians or not, believers or non-believers, Notre Dame has always meant more than mere Gothic splendour. It is the navel of our country, its historical and geographical centre. All our roads start from here, whatever their destination: it is our focal point, our point zero. We convene in it and around it at our big national moments: to rejoice or to mourn. It is hard to think of a significant moment in the history of our capital that has not involved it. In very recent memory, thousands rallied at Notre Dame in November 2015, after the terrorist attacks tainted Paris with blood. But for centuries before that dark time, Notre Dame has been a symbol of our national pride and destiny. It was at Notre Dame that the coronation of Napoleon Bonaparte took place, the beatification of Joan of Arc and the funeral masses for Charles de Gaulle and Francois Mitterand. The cathedral stood up to the “grosse Bertha” artillery during the first world war and it stood defiant through the years of Nazi occupation. 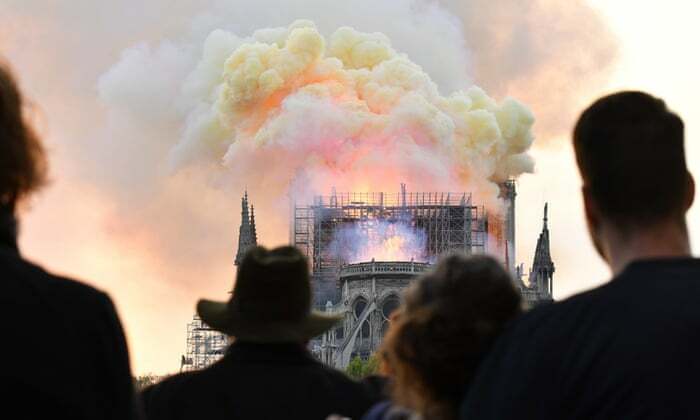 Victor Hugo wrote his masterpiece in which Quasimodo loved Esmeralda in this place – and in that story, as in the awful reality on Monday, the chapel is eventually consumed by fierce, angry flames. The skies of Paris have turned dark blue, as they were in New York on 9/11. The only cause for relief amid the shock is that there are no dead. And we know too now that the stone structure of the cathedral will hold. The ravaged parts of the church will be rebuilt, as they were by Eugène Viollet-le-Duc, the controversial architect, about 150 years ago. France will resist the easy symbolism of our past glory going to ashes, as well as the nauseating conspiracy theories which will undoubtedly flourish on the web. Notre-Dame de Paris will survive, and most of its treasures. But our hearts will bleed for ever. Christine Ockrent is a Paris-based journalist and author. Read the original article on the Guardian.